About six weeks after my knee replacement surgery this past summer, I opened my freezer and thanks to the overcrowded, unorganized situation in there, a 4 cup container of frozen chili fell from the top shelf, landing on my foot, badly bruising it and cracking one toe. 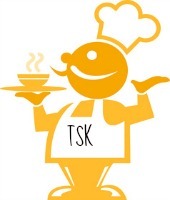 That little incident, seemingly unrelated to cooking, set off a series of activities that resulted in this soup. The most obvious, as you can guess, is that I cleaned out the freezer, and in the process found a ham hock I hadn’t used. You certainly don’t need to include that in this soup, and in fact, I felt the ham flavor was a bit overpowering (I don’t love ham, though). I moved on from the freezer to the crisper drawer of my fridge where I found an assortment of rainbow carrots from my CSA farm. Some were starting to rot, I had to throw out a few (which I hate! ), so I pulled them all out to use up. I also found a couple of leeks from the farm along with a smattering of fingerling potatoes, most too tiny to even serve as a regular meal. I figured the leeks would add a nice aromatic flavor and the potatoes would thicken the soup just a bit more. 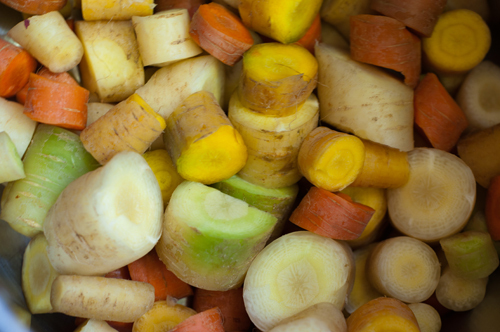 You can leave out the potatoes entirely if you like, and you could use an onion instead of the leeks – remember, creamy vegetable soups are the easiest and most versatile things around. 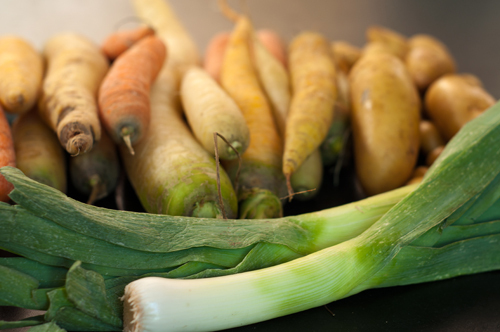 But those rainbow carrots – aren’t they lovely when all cut up together in the pot? 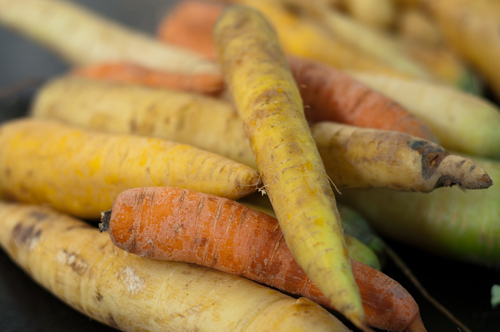 If you use organic carrots (my CSA farm is organic) you don’t have to peel them which helps to retain extra nutrients – and of course, you save yourself a bunch of time in the kitchen too. I used curry paste in this soup because I intend to submit it to The Soup Kitchen monthly event on The Spanish Wok blog. But you don’t need to if you’re not a curry fan. Make sure to have plenty of friends over to eat up your lovely soup, or make sure you have containers on hand to freeze any leftovers – won’t this be perfect on a chilly winter day? 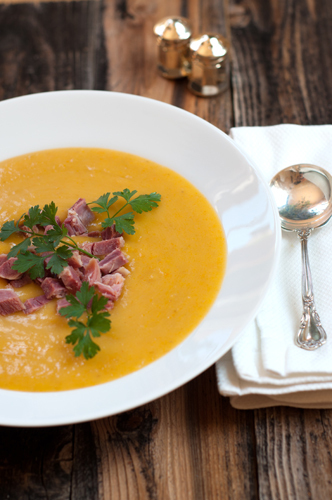 Omit the ham hock for a vegetarian version of this simple soup. Combine all ingredients (except salt and pepper) in a large stockpot and simmer together for 30 minutes. Remove ham hock and shred meat; set meat aside and discard bones. Puree soup using a stick blender or a traditional blender until smooth; season with salt and pepper to taste. Serve ladled into bowls with shredded ham as garnish. I’m sorry but this gave me a chuckle at your poor foot’s expense. I have been there so many times, in fact that is my gauge. When it gets dangerous to open the freezer (or pantry) that’s when I know to clean it out. I adore creamy vegetable soups. They are so reminiscent of the beautiful soups served everywhere in the UK. Ouch! And beautiful soup Michele. waaaaa… Same thing happened to me only it was Spaghetti sauce. Probably no broken bones but major pain and plenty of discomfort until the nail came off. Still very sensitive.. Poor big toe! Now I’m looking at freezer shelf rails. 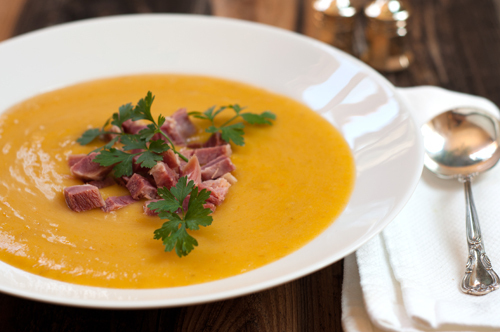 Can’t wait to try this carrot soup, I love carrots and this is looking yummy!